Though born in Wisconsin, I was raised and educated in Utah, becoming a rural family doctor in Ephraim. Having contracted “Albert Schweitzer-itis,” I tried medical projects in Sumatra, Central Mexico, China, and Viet Nam, but found I had more power to do good at home. I opened a free house trailer clinic in Moroni for migrant workers, which was the first in a series of personal experiments in medical care for the poor and uninsured. Early in my career I became involved in organized medicine. Among my early interests were making the profession and hospitals smoke-free, promoting selfless professionalism, controlling healthcare costs, and empowering rural health systems. 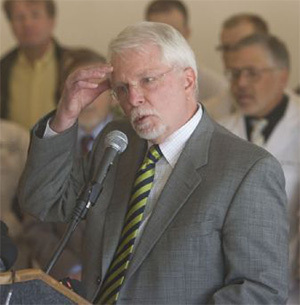 I was president of the Utah Medical Association, helped organize the national young physician group, and headed the AMA council on Long Range Planning. I was named National Family Practice Doctor of the Year in 1993. Still practicing in Sanpete County, I worked several years for IHC as medical director for its nine small rural hospitals, later for its rural clinics, taking part in several system-wide clinical quality improvement projects including pneumonia, diabetes, heart failure, and respiratory infections. In 1998 I began work for HealthInsight, a non-profit group dedicated to healthcare improvement, including promoting responsible use of antibiotics, improved care of heart disease, hospital safety, safer use of pain medications, information systems in practice, waste reduction, and health payment reform. Along the way I’ve joined several Utah government initiatives including work groups on cost containment, rural policy, health manpower, the uninsured, health data, and payment reform. I retired from medical practice in 2010, but apparently still can’t stop doctoring friends, neighbors, and family, nor escape working toward system reform. I volunteer as chairman of the Healthinsight Board and with Utah Citizens’ Counsel.